Prishtina, February 6, 2019 – In-house procurement is a delicate sphere which should be urgently regulated through provisions that foresee equal treatment of public and private sectors in procurement activities, in order to enable fair competition and equal access. 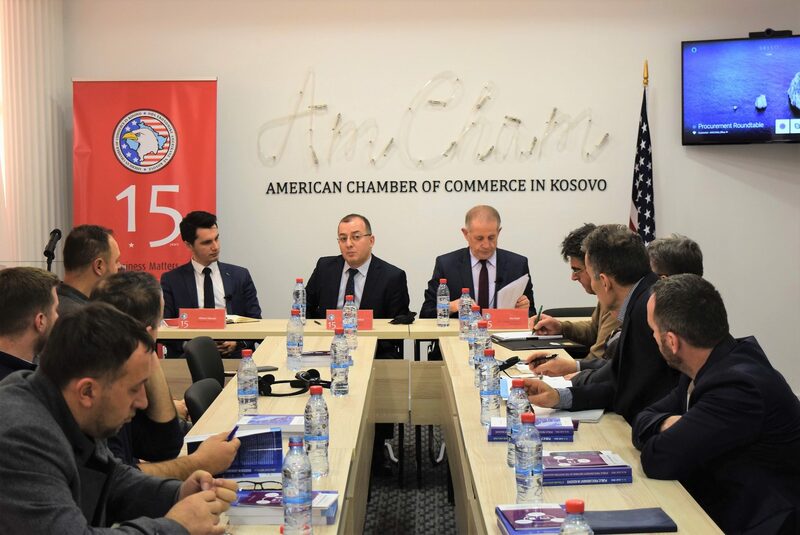 This was said in the roundtable organized by the American Chamber of Commerce in Kosovo. AmCham Policy Officer, Albion Ujkashi, said that “in-house” procurement, respectively purchase of products and services from public enterprises without undergoing public procurement procedures, is a topic that remains a subject of criticisms from business associations, civil society, and international institutions, since the practices applied in awarding contracts are considered to be in conflict with constitutional and legal provisions on equality between public and private sectors, even more so that public enterprises should be treated equally with the private sector in concordance with the Law on Public Enterprises. Head of Public Procurement Regulatory Commission, Osman Vishaj, said that in-house procurement is a field for which this institution, in the past, was obliged to take steps in enabling interpretation of relevant provisions in order to set conditions and regulate this issue which is permissible with the law on public procurement. However, he confirmed that in-house procurement is a sphere which should be considered in being further addressed in the future, and this can be done by drafting the new law on procurement, by encouraging the business community to give comments and recommendations in this direction. Head of Balkan Institute for Public Procurement, Ilaz Duli, said that procurement should be analyzed in general by three components: legislative, institutional, and the implementation component. He said that Kosovo lacks good implementation in this area, especially in regulating issues in in-house procurement, despite having a good stance in the first two aspects with advanced legislation and proper institutional mechanisms. However, Duli said that besides the good legislation in in-house procurement, the current article 9.4 of the Law on Public Procurement foresees that it has never been amended since 2004, thus not following the development of the private and public sector. Furthermore, he said that the provision which allows in-house procurement is quite broad, however it requires the contracting authority before initiating the procurement activity to consider all the possibilities of fulfilling the requirements, whereas the aim of the authority offering services and products should not be the profit. In conclusion, Duli mentioned the problems in in-house procurement in Kosovo that became evident in 2016 with the interpretation of Article 9.4 of the Law on Public Procurement from the Public Procurement Regulatory Commission, therefore it is an issue which directly affects fair competition and should be regulated properly through the new Law on Public Procurement or by changing the PPRC’s interpretation. During the discussion session, participating members informed the panel speakers on the difficulties they have faced in public procurement activities in general, whereas they mentioned the need for equal treatment for public enterprises during procurement activities.